So, the opportunities to do and experience wonderful things on outreach arise daily. I have witnessed the surgeries where cleft lips are pulled together for the first time, visited schools and an orphanage and have learned much about the wonderfully strong Philippine culture and her unbelievable friendly and endearing people. All unforgettable experiences that I was sure could never be topped. Until today. One of the things I think we all think about when the many kids come though the mission is what are they lives like when they go home? Where and under what conditions do they live? What are their families like….what do their parents do for a living? A hundred questions that no one, not even veterans of the missions, have ready answers to, as we always said goodbye at the front doors of the hospital as the patients are discharged home. I was initially introduced to her on Monday as “Patient 18”. She is an adorable four year old kindergartner and was brought to the Roxas Memorial Provincial Hospital for the repair of a cleft lip. I was asked to take her “before” picture. She was in the pre-op ward with her mother and paternal grandmother. Smiling easily at all the strange people who were suddenly interested in her and all immediately taken by her easy-going nature in such unusual circumstances. What a courageous little girl I thought…then went about the hundred other things that outreach volunteers can do on this trip and never gave her another thought until this morning when I was told that I would have the opportunity to accompany her and her family to her home. Whoa. Her name is Milden. She lives with her family about an hour’s drive, a bumpy, twisty, sometimes sketchy, drive outside of Roxas in the town of Cuartero. 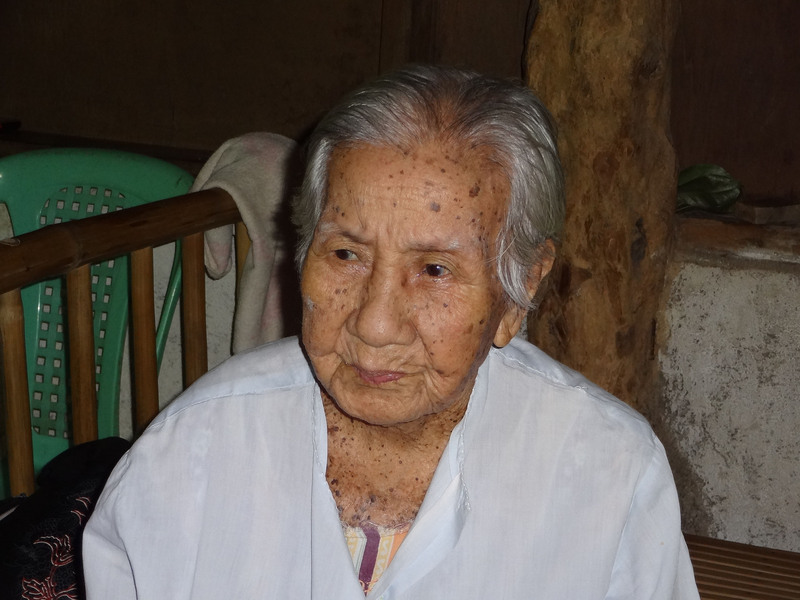 Milden understandably slept most of the way home, but through an interpreter we were able to learn that she lived with her maternal grandparents and a 97 year great grandmother. Her father is a security guard in Manilla who travels home for several weeks only once a year to see his family. Her mother washes clothes when she can. 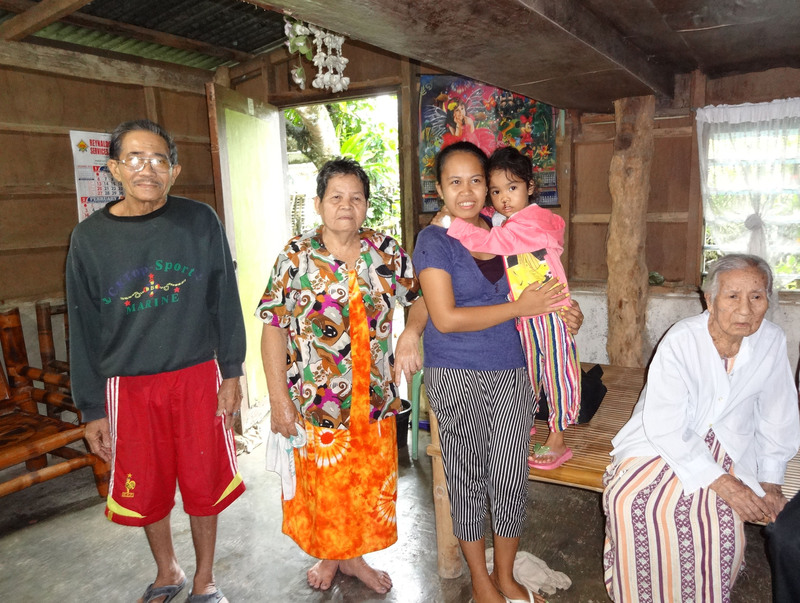 Their combined monthly income is 7200 pesos, give or take, which comes out to $180 a month. No, it’s not a typo! Their home backs up to a large rice field and is adjacent- in a very random way- to an indoor outdoor basketball court that is inexplicably covered in spots and fully exposed in others. We had to walk across the basketball court to get to the front gate as it is situated mid court and well off to the side. Inside the gate to the right was the family outhouse. To the far left is the pump from which the family draws all of it’s water. Yes, there is no indoor plumbing. 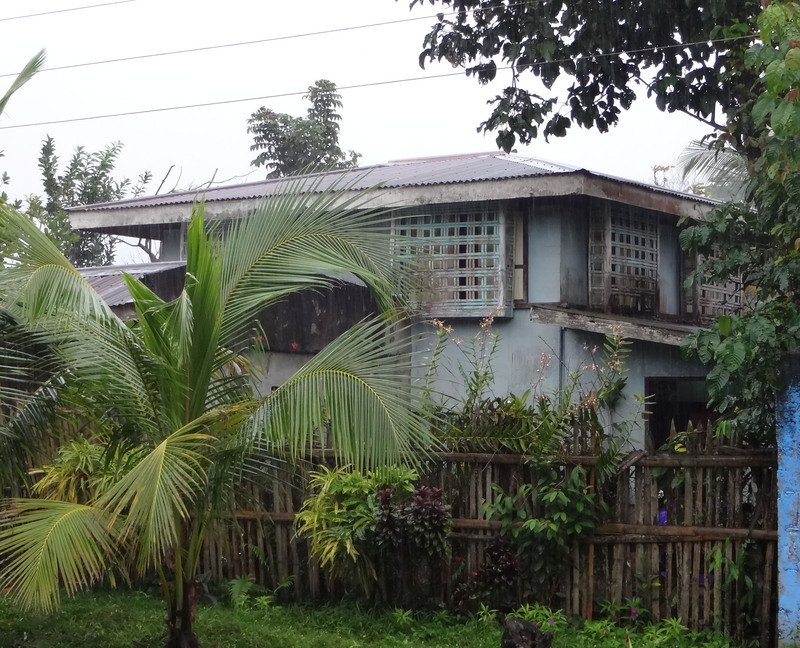 The home is of bamboo construction with a metal roof. We were experiencing a tropical depression which in the Philippines means rain and lots of it, so the first thing you noticed when you entered the home was the noise of the rain hitting the tin roof. 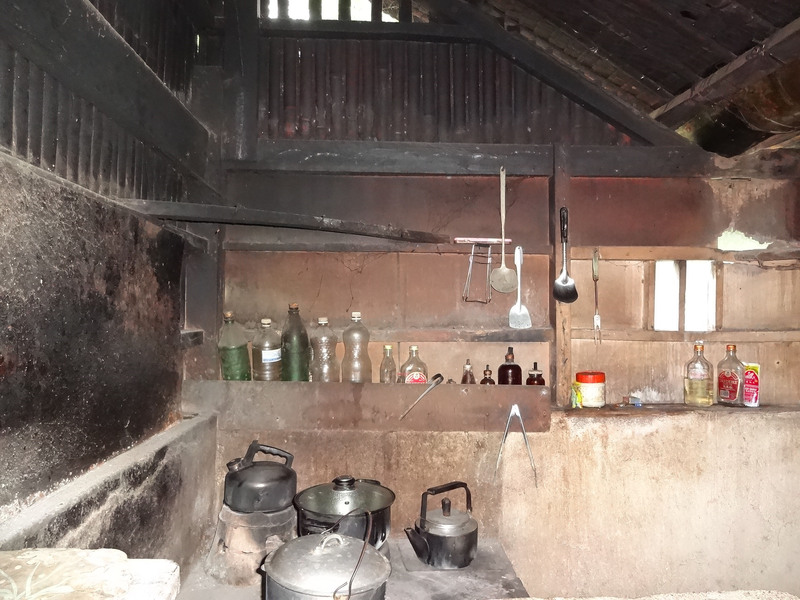 The second thing you noticed was all the jugs for drinking water, a jug for water used for doing dishes, laundry, bathing, etc., that had to be carried from the courtyard into the home, and the faint smell of smoke from the wood burning stove. There were a total of four lights in the entire home. They were very small bulbs so on a cloudy afternoon the interior of the home was almost dark. We met Milden’s aunt, her grandparents and her great grandmother. They are very loving people who were so very happy to have “their” little girl back home with them. After staying a while and learning a little more about the family it was time to go. One of Milden’s grandmothers referred to the mission medical team as “gifts from god” as she and Milden’s mother thanked us for the thousandth time for allowing Milden to have a life changing procedure. The entire time we were in the home, Milden never left her mother’s arms. 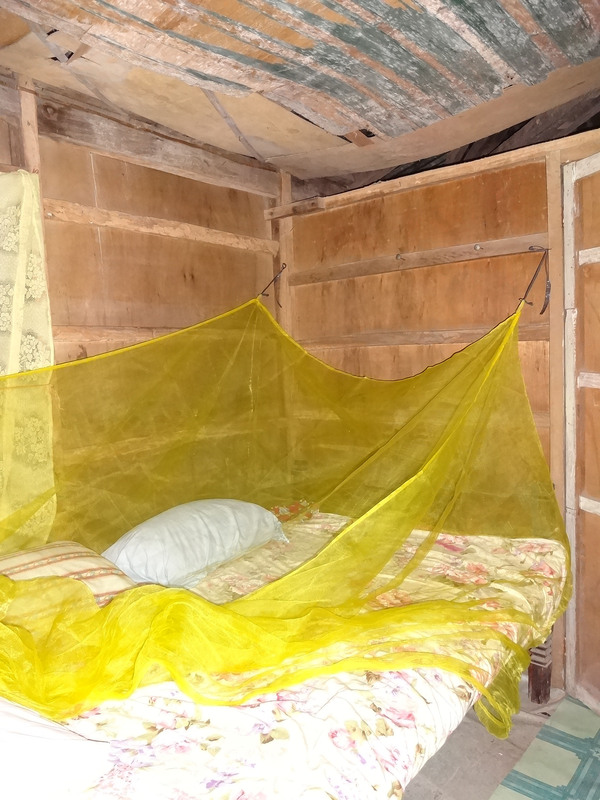 We were able to see Milden’s bedroom, replete with mosquito netting and no lighting. But to see how happy she was to see her bed, and how much she wanted to just get in it after her last 36 hours, whatever I or anyone else may conclude about living conditions in a relative sense, she was home, with her family, and that was clearly all that mattered. I hope others on our mission will have the unbelievable opportunity to visit our patients after discharge. Yet another truly unforgettable, moment courtesy of Mending Faces.